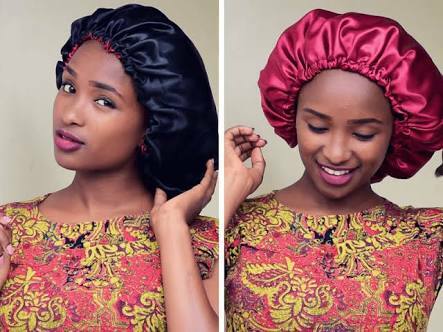 Every girl needs to protect her hair at all times especially at night.Satin Bonnet is good for hair, especially for natural hair. It helps to reduce frizz, tangling and wear and tear of hair from sleep. a yard of elastic strip. Spread your material over a bowl and cut out a round shape from your material. Turn your cut out to the opposite side and line its edges with the elastic. Cover the elastic with the material and sew, leaving a small length of the elastic out. Cut out the excess elastic and your bonnet is ready for you to rock. Ifu Ennada Has Most Gorgeous Natural Hairstyles You Can Try!